William Temple Hornaday (1854-1937) was a hunter, taxidermist, zoo director, and founder of the American conservation movement. After serving as a taxidermist at Iowa State Agricultural College and Ward's Natural Science Establishment in Rochester, New York, Hornaday undertook a series of scientific expeditions to Florida, Cuba, the Bahamas, South America, India, Sri Lanka, the Malay Peninsula, and Borneo in the 1870s. He soon became known for his dramatic "life groups" of animals in natural settings for museum displays. In 1882, he was appointed Chief Taxidermist of the United States National Museum at the Smithsonian Institution. In 1886, Hornaday traveled to Montana to collect specimens of American bison for a display at the National Museum, since it was widely believed that the bison would soon be extinct, due to hunting for their hides. Hornaday was shocked to see that the large herds he had seen years earlier had vanished and only a few animals survived. The letters below document his conversion from hunter to conservationist. He collected specimens for his display, but also dedicated the remainder of his life to the conservation of this species. He also acquired live specimens which he brought to Washington, DC, and placed on display behind the Smithsonian Castle. Hornaday's goal was to educate the American people about these magnificent animals and generate interest in environmental conservation. He also produced a very popular exhibit of a bison group for the National Museum. The live animals proved even more popular, leading to the founding of the National Zoological Park as part of the Smithsonian in 1888, with Hornaday as its first director. In 1889, Hornaday published The Extermination of the American Bison a popular work that did create public support to save this species. In 1896, he was appointed director of a new zoo, now known as the "Bronx Zoo," established by the New York Zoological Society. He remained there for the next thirty years, creating the foremost zoo in the United States and continuing to emphasize the importance of saving American native wildlife. Letter dated December 21, 1886, to Professor Spencer F. Baird, Secretary of the Smithsonian, about collecting bison specimens for an exhibit. Letter dated December 2, 1887, to Professor George Brown Goode, Director of the US National Museum, expressing concerns about the conservation of American bison. 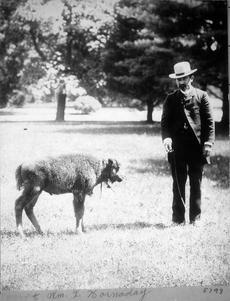 Photographs of William Temple Hornaday, the American Bison exhibits at the US National Museum, and the National Zoological Park.